This Land Rover Defender is sold. 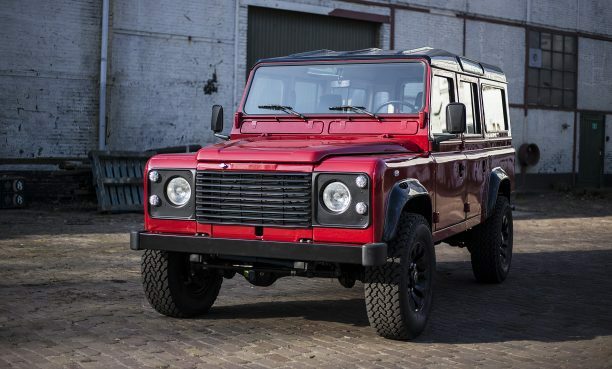 Buy yourself a factory original Land Rover Defender 110, left-hand drive 5-door station wagon with a V8 motor. It has a stunning low mileage of 13073 original miles. The D110 has been taken apart and a lot of work has been done to it. First of all the body panels are sprayed separately in the beautiful colors Portofino Red and deep black. Second, the bottom has a full stone-chip protection coating to make sure the car stays this nice. Then we reassembled the Land Rover Defender again. You can ride in style with ”16 Sawtooth Alloy wheels and General Grabber AT2 tires and a great sound coming from the new stainless steel Sport exhaust with headers. All the technical maintenance is done with new fluids and filters. You can enjoy a clean Defender with all new rubbers and seals and a full new carpet set. The new owner can also enjoy a little more silence because of the extra soundproofing. Is this your next drive? The Land Rover D110 is sold.